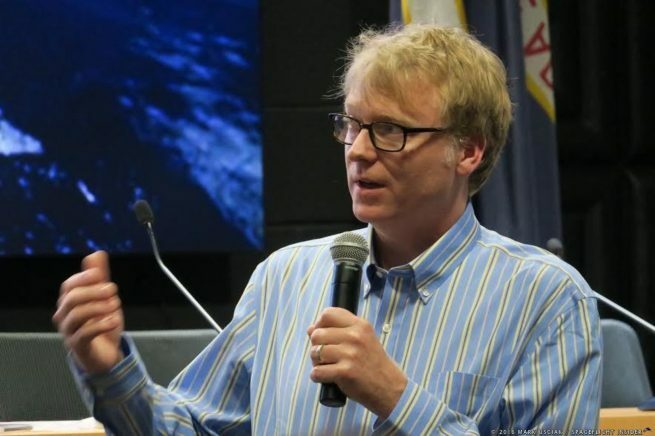 WALLOPS FLIGHT FACILITY, Va. — As members of Orbital ATK made their way to the OA-5 Launch Readiness Review, NASA held a “What’s On Board” briefing on Oct. 15 at the auditorium located at the Visitor Complex at Wallops Flight Facility in Virginia. 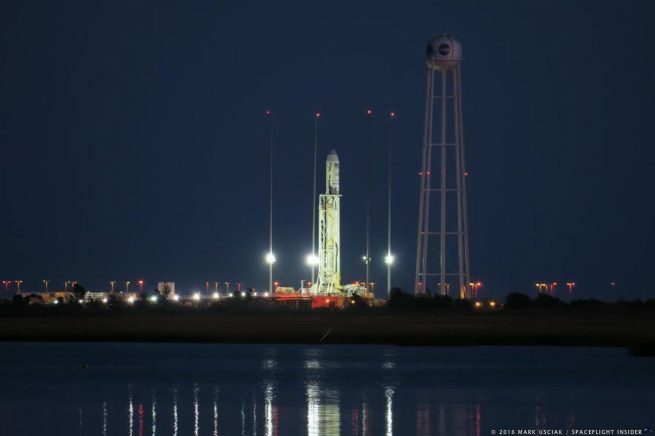 Weather conditions for launch – scheduled for 8:03 p.m. EDT Oct. 16 (00:03 GMT Oct. 17) – simply could not be better with clear skies and forecasters providing a 95 percent chance of favorable conditions for the launch of Antares with the S.S. Alan Poindexter Cygnus spacecraft. The launch will see some 5,100 pounds (2,300 kilograms) of cargo sent to the International Space Station (ISS). This includes 2,300 pounds (1,000 kilograms) of scientific cargo – one-third of the spacecraft’s total payload. More than 100 experiments are taking place on the ISS at present. These include studies in biology, Earth and Space, human and microbiology. In total, more than 2,000 experiments with more than 2,900 scientists involved in some 95 countries have been performed in the 16-year lifetime of the space station program. Cygnus will arrive at the orbiting laboratory on the morning of Oct. 19. It will be captured by the robotic Canadarm2 and berthed to the Unity module’s Earth-facing port. It is scheduled to stay attached to the ISS for about a month. After departing the station in late November and moving to a safe distance, Cygnus will again serve as an uncrewed laboratory. The soda can-shaped vessel will once again have an experiment on board to study the spread of flames in the microgravity environment. At the “What’s On Board” briefing, Jitendra Joshi, technology integration lead for NASA’s advanced exploration systems division, discussed SAFFIRE II, the follow-on to the SAFFIRE I experiment on the last Cygnus spacecraft in March 2016. SAFFIRE is an experiment designed to study flame propagation on certain materials. It is the largest flame experiment ever sent into space. Previous studies burned materials that were the size of a small note card. SAFFIRE I burned a 16 by 37-inch (41 by 94-centimeter) piece of SIBAL cloth – a blend of fiberglass and cotton. However, SAFFIRE II will burn nine smaller samples of varying thickness and material. Joshi said SAFFIRE III, which will be sent up on the next Cygnus in late 2016 or early 2017, will burn the same large material as SAFFIRE 1. Additionally, there will be at least three more fire experiments over the next year or two going all the way to SAFFIRE VI. The last three will focus on how different materials burn and interact with each other. Additionally, some scrubbing material will be tested for cleaning up combustion products produced. Another experiment being sent into space to be performed by the crew of the ISS is the Cool Flame Investigation (CFI). Jesse Robins, a systems engineering for CFI, discussed what these “cool flames” were and why the crew of Expedition 49 and 50 will be studying it. In the microgravity environment, fires using different fuels can behave very differently than they do here on Earth. In certain cases with certain fuels, after the hot flame extinguishes, a “low-temperature” chemistry event happens which scientists call a “cool flame”. Robins compared this to “trick birthday candles”: just when you think it’s out, it reignites. While this might be fun at parties, it could pose a risk to crews on long-duration missions. With NASA currently working to send crews to Mars, this experiment could serve to select fuels that lack “cool flames” properties. CFI will be performed in the Combustion Integrated Rack located in the Destiny module of the ISS. It includes an optics bench, combustion chamber, fuel and oxidizer control, and multiple cameras. An environmental journalist asked Robins at the briefing to break down why this experiment was important. He responded that it should allow for more fuel-efficient engines to be produced. “If we can characterize and leverage the findings from this experiment they can be incorporated into future technology that can possibly create cars that treat the world much better,” Robins said. Cygnus is also carrying to space a set of weather monitoring nanosatellites. They will be deployed from the side of the cargo ship prior to the SAFFIRE II experiment being performed.